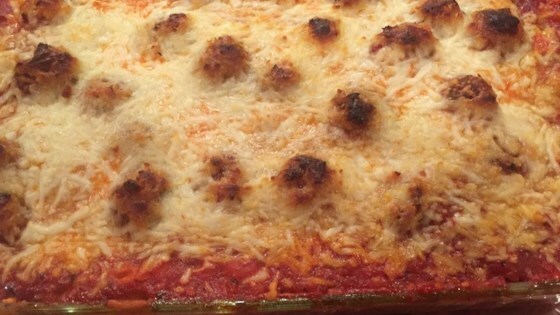 "This is an Italian casserole dish that the whole family will enjoy. It has a creamy and cheesy filling that will have the kids, and everyone else, asking for more." Mix ground beef, green onion, bread crumbs, and Parmesan cheese together in a bowl; form into 1-inch meatballs. Arrange meatballs in a baking sheet. Bake in the preheated oven until no longer pink in the center, 15 to 20 minutes. An instant-read thermometer inserted into the center should read at least 160 degrees F (70 degrees C). Arrange bread slices in a single layer in a 9x13-inch baking dish. Combine cream cheese, mayonnaise, Italian seasoning, and pepper in a bowl; spread over bread slices. Sprinkle 1/2 of the mozzarella cheese over the cream cheese mixture. Combine spaghetti sauce, water, and garlic in a bowl; add meatballs. Pour spaghetti sauce mixture over bread. Sprinkle remaining mozzarella cheese over casserole. How can review a recipe you have never tried, are you professional chef, actually try the recipe before you review it. Delicious but incredibly rich. Next time I will probably swap cooked pasta for the bread. Thanks! Try it this way--toast the bread, top with cream cheese mixture, mozzarella, meatballs heated with sauce, and remaining mozzarella. Broil till melted and bubbly.